Bvlgari has been setting the pace for Italian style in jewellery for over a century. The same style has now been captured in a fragrance. 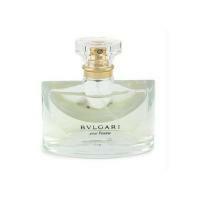 Launched in 1993 by Bvlgari, this self-titled fragrance Bvlgari pour Femms is a serene, sensual fragrance created by Sophia Grosjman. Its' refined bouquet opens with top notes of mimosa, violet, iris, and orange blossom, symbolic of naturality and purity. Heart notes of bulgarian rose and jasmine tea, followed by base notes of florentine iris, vetiver and madagascar musk, reveal a modern sense of clarity, serenity and sensuality. Top: Carnation, Violet, Raspberry, Bergamot. Heart: Orris Root, Iris, Heliotrope, Bulgarian rose, Egyptian jasmine. Base: Amber, Sandalwood, Musk, Vanilla, Green tea.